Marjorie and Richard Brightman had a perfect team for creating the serene landscape they wanted for their Landfall home. Their son and daughter-in-law, both landscape architects, worked with Classic Landscapes, to achieve a garden of great, natural beauty. 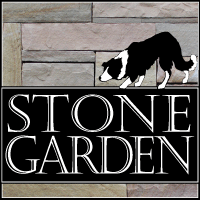 A set of bluestone steps from the back patio leads onto a flagstone path that wanders through stunning perennial flower beds. The Cento Urn Fountain above provides a perfect focal point and the tranquil sound of trickling water while they enjoy their back deck. Corinthian Bells are hand-tuned to produces a note that is true to its scale. Made from a durable aluminum alloy, they are perfect for the beach environment. Choose from six designer colors, and sizes ranging from 27 to 74 inches. 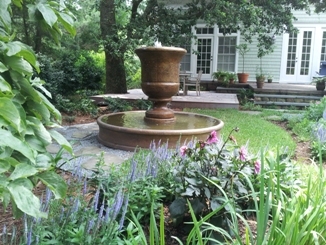 Let us help you select a perfect water feature to cool down your garden. Many styles and patinas to choose from at the store or through our extensive catalogue collection. LIMIT ONE COUPON PER CUSTOMER. EXPIRES 7/31/13. LIMIT ONE SALE PER CUSTOMER. EXPIRES 7/31/13.